Universal Pictures and Legendary’s “Straight Outta Compton” will reach an estimated $200 million at the worldwide box office on Monday, the studio announced. This marks Universal’s seventh film to reach the threshold in 2015. The film’s current domestic gross is $161.1 million, with the international gross expected to be $38.9 million by end of day. “Straight Outta Compton,” directed by F. Gary Gray and produced by Dr. Dre and Ice Cube, was the No. 1 R-rated August opening ever, and held that position at the North American box office for three weeks in a row. On Friday, former N.W.A manager Jerry Heller sued former clients Ice Cube and Dr. Dre for defamation, claiming that his portrayal in the film “Straight Outta Compton” was unfair, and that he didn’t give permission to use his likeness in the film. Heller, who was portrayed by Giamatti, is also suing NBC Universal and Eazy-E’s estate, among others. Heller is asking for at least $110 million in the complaint. 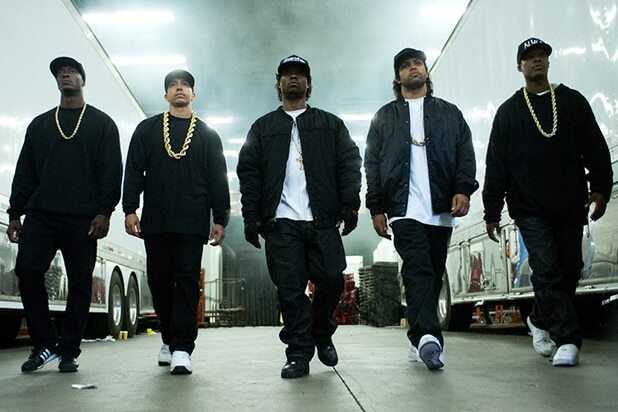 The biopic about the rise and fall of N.W.A blazed into box-office history with a $60.2 million debut, the biggest opening ever for an R-rated film in August. The drama, about a struggling young rapper (Eminem), made $116.8 million domestically at the box office. 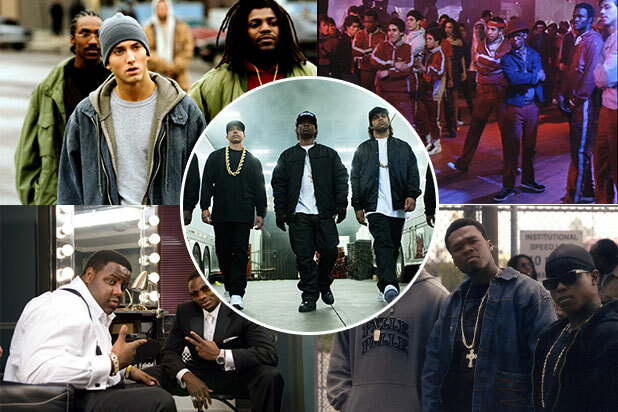 With a budget of $41 million, this hip-hop movie was a big baller for Universal. Chronicling the life and death of rap icon Notorious B.I.G., the film had a budget of $20 million and made $36.8 million domestically. It starred Jamal Woolard and Derek Luke. 50 Cent starred in this semi-autobiographical drama about a drug dealer who turns away from crime to pursue a career in rap. It made $30 million domestically off a $40 million budget. This movie about a magazine editor who falls in love with a hip-hop record exec starred Taye Diggs, Sanaa Lathan and Mos Def. It made $27.3 million off a budget of $8 million. Warren Beatty directs and stars in this drama about a politician who decides to start speaking the truth and using rap music to get his point across. Isaiah Washington and Halle Berry co-starred in the film, which made $26.5 million at the domestic box office. However, it had a $30 million budget. Terrence Howard, Anthony Anderson, Taryn Manning and Taraji P. Henson star in the Oscar-winning film about a Memphis pimp who strives to become a successful hip-hop MC. It made $22.2 million domestically on a $2.8 million budget. Chris Rock co-wrote and starred in this "mockumentary" about the rise to fame of MC Gusto, Stab Master Arson and Dead Mike, members of the rap group CB4. It grossed $17.9 million at the box office. The movie centers around an aspiring DJ from the Bronx who tries to expose people to hip-hop. The film grossed $16.6 million at the domestic box office. The drama is based on the early days of Def Jam and follows Russell Walker as he manages up-and-coming acts, which included Run-D.M.C. It starred the real members of Run-D.M.C. and and the Fat Boys. It grossed about $11 million at the box office on a $3 million budget.